The 2011 twin-cam Infinity has a deep, draft forward profile that gently pulls you up and onto a plane without pumping. Since the Infinity has a massive wind range, you can easily jump one meter increments between sail sizes, which means fewer sails in your quiver. There is no need to purchase a new mast because the Infinity will rig on any mast made within the past 20 years. It fits great on RDM and standard diameter masts. The Technora® and Tri-Lite materials used in the Infinity are much lighter than monofilm and will last many years longer. Thanks to the color coded downhaul marks and the color coded outhaul cords, making the sail’s huge wind range easy to navigate. 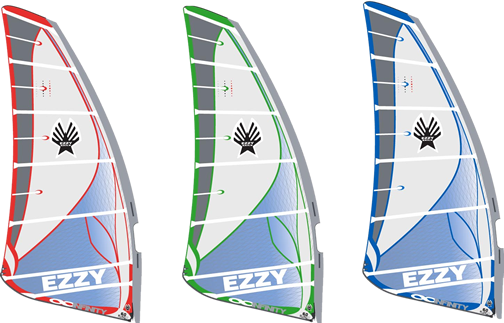 My wife and I have been riding Ezzy for a couple of years and love our sails, We have Panthers sails from 4.2 to 5.8. I recently buy a new Infinity 2011 6.5 after testing many other cams sails I can tell sailing an Infinity is a great difference. The first thing I noticed is that the sails rigs very easy, I just followed instructions and Dave’s video and rig the sail is just a few minutes. I like the part that it rigs perfectly on the RDMs and that are not very demanding on downhaul compares to others brands. On the water the 6.5 feels very light, and in terms of power, on my first day I was planning on a 105 lt slalom board on just 14-15knt of wind and I am 175lb. The sails feels very stable, I was able to control the board and sail without issues, on other sails I was having hard time looking for a correct stance to control my board. During transitions, the cams were rotating quick and easy.